SHIRLEY GRIFFITH: And I’m Shirley Griffith. This week, we tell about the latest winner of the Tyler Prize for Environmental Achievement. We tell about some effects of the earthquake and tsunami in northeastern Japan. And we tell about an albatross thought to be America’s oldest free-flying bird. BOB DOUGHTY: Bees are important for agriculture. Farmers need bees to pollinate plant crops. The insects also provide a natural sweetener, honey. But many bees have mysteriously disappeared in recent years. This year, an American researcher was the winner of the Tyler Prize for Environmental Achievement. May Berenbaum of the University of Illinois is searching for solutions to the bee crisis. For thousands of years, people have had a love–hate relationship with bees because they sting. Many people have experienced bee stings themselves or know of others who were hurt. SHIRLEY GRIFFITH: May Berenbaum says farmers depend on bees to pollinate nuts, melons and other crops. Bees are directly responsible for pollinating nineteen billion dollars worth of crops each year in the United States alone. However, many bees have disappeared in what scientists call colony collapse. The worker bees suddenly disappear, and the colony dies. This has been a problem in North America, especially in the past five years. Scientists do not fully understand the problem. May Berenbaum says there are many likely reasons for the collapse. One is the long-distance transport of bees for pollination and the spread of bee diseases from one area to another. She says the effect of disease is made worse by the buildup of insect-killing pesticides in bee colonies. May Berenbaum and other scientists are studying the problem. She suggests one way that people can help. BOB DOUGHTY: May Berenbaum says people also can help the honeybee by planting more flowers and showing less hostility toward weeds. Some unwanted plants provide food for pollinators like bees. Recently, Ms. Berenbaum was in Los Angeles to accept the Tyler Prize for Environmental Achievement. Earlier prize winners include the biologist Edward O. Wilson, the primatologist Jane Goodall and conservation biologist Paul Ehrlich. May Berenbaum says these and other winners are among her scientific heroes. She received two hundred thousand dollars with the award. She says the money will help expand a project of hers involving citizen-scientists. BOB DOUGHTY: She says that project is already leading to information. SHIRLEY GRIFFITH: May Berenbaum collected directions for preparing meals involving honey in a book. It is called, “Honey, I’m Homemade: Sweet Treats from the Beehive, Across the Centuries and Around the World.” And she says the honeybee, in addition to its important work as a pollinator, makes our lives a little sweeter. BOB DOUGHTY: The earthquake and tsunami that hit northeastern Japan in March continue to have far-reaching effects. Radiation has been leaking from the Fukushima power station since March eleventh. The earthquake and tsunami damaged cooling systems at all six nuclear reactors there. High levels of radiation have been found in the soil, sea water, fish and agricultural products for kilometers around the power plant. Tens of thousands of people have left the area. SHIRLEY GRIFFITH: American researchers are predicting that floating wreckage from the disaster could reach the Hawaiian Islands within two years. Jan Hafner is a scientific computer programmer with the International Pacific Research Center at the University of Hawaii. He says that an island of wreckage has already moved a few hundred kilometers away from Japan. The wreckage includes cars, trees and homes that were washed away from Japan. Strong ocean currents are now carrying this trash across the Pacific Ocean toward the western United States. Jan Hafner says that by the time the trash arrives, it will turn into what he is calling “the North Pacific garbage patch.” He expects more wreckage to continue floating toward Hawaii for about five more years. BOB DOUGHTY: The predictions are based on a diagnostic model. Scientists developed the model by using realistic information about objects floating over the ocean surface. The projections are not good news for Hawaiian coastal communities. The usual trash that washes up on the islands represents an environmental danger. But large pieces of wreckage also represent a possible threat for ships sailing across the Pacific Ocean. The United States Navy’s Seventh Fleet has said the largest trash field is more than one hundred kilometers long. SHIRLEY GRIFFITH: America’s oldest free-flying bird is said to be doing well a few weeks after a tsunami wave hit the island where she lives. 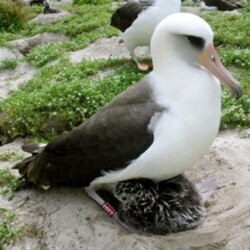 The United States Fish and Wildlife Service discovered in March that a Laysan albatross named Wisdom had survived. An agency employee observed the bird and her chick about a week after a one and one-half meter high wave washed over Wisdom’s home. The bird lives on Sand Island in the Pacific Ocean. Sand Island belongs to the Midway Atoll National Wildlife Refuge. The wave hit the island after the earthquake struck Japan on March eleventh. Wisdom is at least sixty-five years old. The chick is thought to be her thirty-fifth baby. Their survival was unusual. The tsunami killed an estimated two thousand adult albatrosses and about one hundred ten thousand chicks from Wisdom’s nesting area. BOB DOUGHTY: About one million Laysan albatross live in the wildlife refuge. But the tsunami decreased the baby-bird population by twenty percent. Wisdom is the oldest wild albatross known to a research program supervised by American and Canadian scientists. The program has operated for ninety years. Wisdom first had a metal identification band placed on her in nineteen fifty six. At the time, she was at least five years old. Biologists estimate that she has traveled almost five million flying kilometers since then. An albatross is one of twenty-one kinds of large sea birds that reproduce in Hawaii. They get their food from off North America’s West Coast, including the Gulf of Alaska. SHIRLEY GRIFFITH: Finally, an American study has attempted to confirm the idea that cats are deadly enemies of birds. The study found that, if you hold that belief, you are correct. At least that is true near Washington, DC. The Journal of Ornithology reported the findings. The report says the common housecat is the number-one killer of fledgling gray catbirds near America’s capital. It says predators were responsible for almost eighty percent of the deaths of the baby birds in the study. Predators seize and kill others. Cats killed almost all of the fledglings that died. Scientists from the Smithsonian Institution and Towson University in Maryland led the study. It took place in three capital-area communities. Death rates were especially high where many cats live. BOB DOUGHTY: The researchers placed electronic equipment on the birds so they could follow them. They learned that in some places, the killing of baby birds is decreasing the gray catbird population. Killings by animals are the second largest cause of bird death in the United States. The American Bird Conservancy reports that cats kill hundreds of millions of birds nationwide each year. The group says half the cats responsible for bird death have human owners. The other half are said to be feral, or homeless, cats. But the top cause of bird deaths is crashes into windows, buildings and other structures. The Fish and Wildlife Service says wind turbines kill four hundred forty thousand birds yearly. That number, however, is expected to rise above one million by twenty-thirty, as more wind farms are built. SHIRLEY GRIFFITH: This SCIENCE IN THE NEWS was written by Brianna Blake and Jerilyn Watson. I’m Shirley Griffith.